Aligning historical events with family history, Heart of a Cuban exposes the account of Cubans who refused to be pushed like pawns by evil government leaders, and one boy’s refusal to give up on the dream his great-grandparents had for a free Cuba. Amidst the backdrop of an idyllic childhood spent on his family’s farming estates in the tropical hills of Cuba’s agricultural region, it is an incredible true journey of one family’s escape from Fidel Castro. Andrés was an innocent boy excelling in school and honoring his culture’s heritage until the murderous leader came into power, eager to spew his icy talons across the vulnerable country. Born of two families of heroes who had overthrown Spanish Colonial rule half a century before, Andrés was taught how sacrifice was necessary in order to obtain a greater good. When his devout religious foundation seems inadequate at preparing the youngster for dealing with Castro’s extreme cruelty, Andrés is forced to adapt and to learn the lessons gleaned from studying his ancestors and the heroes in Cuba’s history. After his grandfather’s lifeless body crumples before him riddled with bullet holes from Castro’s guerrillas, it soon becomes apparent to his family that both his father and he might be next to fall.Escaping could mean immediate death if discovered by Cuban’s newly minted Communist soldiers; while treachery in the form of dehydration, shark attacks, and storms waited if they left. With the Vietnam War raging in another far-off land due to Communist persuasions, what would lie ahead for Andrés if they did make it to America? Heart of a Cuban becomes much more than just a story as the author must answer urgent questions about humanity if Andrés is to find the path necessary to assure his own, and his family’s, survival. When the extreme brutality of a world exerts its will on people and invades their peace, nothing more is left for one to do but to gather all of their courage in the face of fear and look it straight in the eye. It is the decisions Andrés makes that will make all the difference not only to himself, but to all those near and dear to him in family, neighborhood, and among his friends … for all time. NJ Perez is a Cuban-American descendant of two heroes of the Cuban War of Independence. “Yanks” call it the Spanish American War. NJ grew up in the farming area of Cuba south of Havana in the Cacahual mountains. Graduated from Florida Atlantic University with a Bachelor’s in US History. He was a teacher, school administrator, entrepreneur, and workforce development consultant to foreign countries and an authority on Cuba (he is from there). 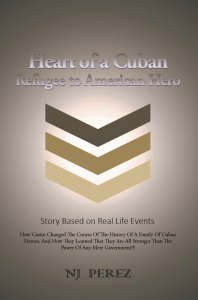 His debut historical novel based on real life events – Heart of a Cuban has garnered 5 stars reviews, top seller status and was a American Book Fest Award finalist. He lives in the American Southwest, where he listens to Cuban music, wanders around with his dog, tries to keep up with his grandchildren and loves to hear from readers.